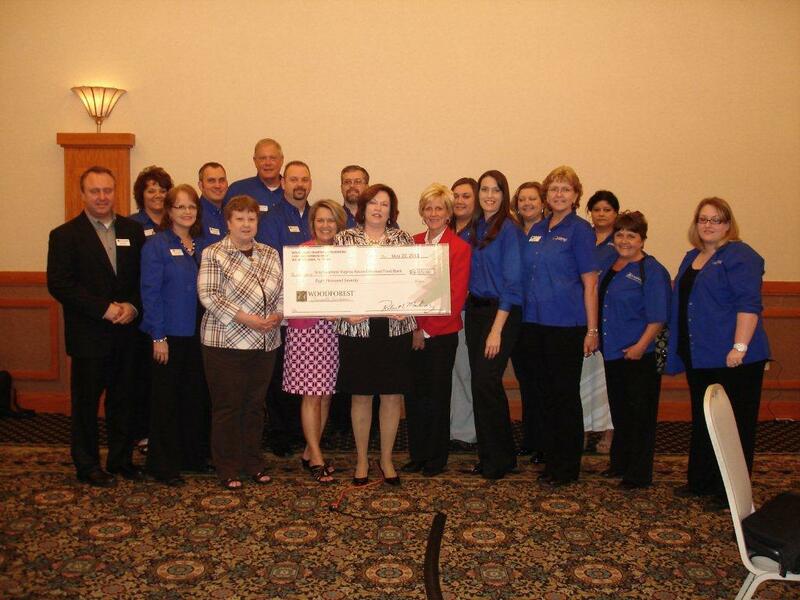 Feeding America Southwest Virginia receives $8,070 donation from Woodforest Charitable Foundation. Photo Caption:Presenting the check (left to right) is Dan Holley, Assistant Vice President, Virginia/Maryland, WNB; Tracey Houchins, WNB Branch Manager, Christiansburg, VA; Donna Pucket, WNB Branch Manager, Norton VA; Charles Conduff, WNB Branch Manager, Wytheville, VA to Feeding America Southwest Virginia representatives Linda Lawrence, VP of Finance; Jenny Doud, VP of Principal Gifts and Pamela Irvine, President & CEO; Ben Ansley, WNB Branch Manager, Galax, VA; Dwayne Addison, WNB Branch Manager, Bristol, VA; Dale Philpot, WNB Branch Manager, Roanoke, VA; Shelly Lynch, Director of Operations, Woodforest Charitable Foundation; Jennifer Foley, WNB Branch Manager, Roanoke, VA; Jessica Valentine, Senior Vice President - East Coast Division, WNB; Terri Lawson, WNB Branch Manager, Pulaski, VA; Jean Clay, SW VA Regional Manager, WNB; Charlotte Bradshaw, WNB Branch Manager, Danville, VA; Teresa Cahill, WNB Branch Manager, Martinsville, VA and Amber Gordon, WNB Branch Manager, Roanoke, VA. Feeding America Southwest Virginia recently received an $8,070 donation from the Woodforest Charitable Foundation and Woodforest National Bank.